Windows Meeting Space is a peer-to-peer collaboration program that allows you to share documents, programs, or your desktop with others. You can share your desktop or a program with other meeting participants. You and the other meeting participants can share and co-edit documents. One saved change is replicated immediately to every other meeting participant. Any file or application can be broadcast or streamed, not just Microsoft applications. The administrator has the ability to limit the file types that can be shared. The built-in logging feature can audit activity and write to the event log during a session. You can pass notes among the participants. You can connect to a network projector for a presentation. 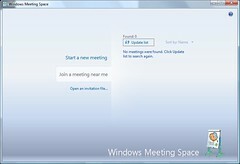 Windows Meeting Space automatically creates an ad hoc network, if it can't find an existing network. You can start a new meeting or join a meeting someone else has set up. You can invite others on the network to join. You have password protection and the session initiator decides who can join the session. Windows will automatically configure Windows Firewall the first time you start Windows Meeting Space. You will be prompted to setup and enable People Near Me. If you know of a meeting in progress you would like to join, click Join a meeting near me. If you know someone has sent you an invitation file, click Open an invitation file. After you invite participants to your meeting and you want to share a document or your desktop, click Share a program on your desktop. Then, select the item you want to share. If you want to distribute handouts to the meeting participants, click Add a handout, and select the file you want to share. During the session share, you have control of your desktop and programs. If you want to pass control to another participant, you can do so, even though you can always take back control, either by clicking Take Control or press the Windows logo key + ESC.